Free Onboarding Template – how to set up a simple onboarding process? One of the principal principles of IT recruiting is the need (and the ability) to keep all the information, files and documents perfectly categorized. Each recruiting agency should develop their own system that will help them collect all data and keep team members and clients in loop. Luckily, there are numerous tools that can help recruiters keep track of applicants, CVs, interviews and appointments. Some of these tools should be frequently used in other segments of hiring process too. They can improve onboarding process and help your team welcome aboard new members with ease. Onboarding process is about welcoming a new employee onboard by helping them adapt to the new environment. It usually takes place within the first month and it implies introducing a new colleague to the rest of the team and to his new duties, schedule and responsibilities. Everyone on the team should be providing them with information and participate in making their adjustment period easy and stress free. Onboarding process should be done strategically but it must contain that certain something that distinguishes your team from others. Plan this process carefully and keep it friendly. Why is Onboarding Process important? Some researches show that it takes a year for new employees to fully adapt and reach the level of achievement their (veteran) colleagues are at. Not saying statistics lie, but a whole year does sound a little excessive. Especially if we have in mind there are many ways we can help out new colleagues. Being clear about tasks, targets, goals and objectives is mandatory. Your colleagues and employees are familiar with your ways, but it a newly hired person will most likely need some time to adjust to the environment. And the adjustment does depend on the onboarding process. Developing an onboarding program strategy and setting it in motion will most likely have a positive impact on your finances, among other things. The costs of losing an employee are way higher than the investment you’d make in onboarding process. Back to the researches and statistics - first year of employment does turn out to be crucial. Companies lose over 25% of all new employees within this period. It is known that a successful onboarding program has the power to increase employees’ productivity up to 54%. This program should be carefully planned and custom made - although some steps need to be followed, you should follow them in a way that suits your company. Stick to the plan and gradually incorporate a new member into your teams’ ways and daily occupations. Employee retention is another important aspect you need to look into and take care of. 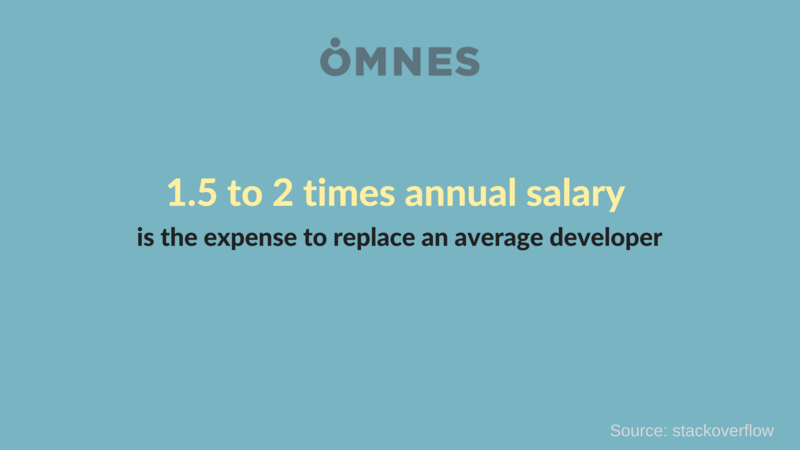 Losing a new employee can seriously damage your budget and affect your projects. Standardised onboarding process will largely contribute to the improvement of this aspect. Onboarding program done right will increase employee retention up to 50%. Happy and healthy working environment consists in various components. Cool projects and good organisation are just one part of the story. There’s more to team work than that. It’s important for everyone in your company to feel accepted and to feel free to ask questions and speak their minds. People on your team need the right amount of autonomy and some room to grow, but they’ll also need supportive and trustworthy environment. Onboarding program helps newly employed to feel welcome and to truly become part of the team. Onboarding process should begin before the new employees’ official day one. It’s important to cover the initial “getting to know each other” ground. First impression and proper introduction are always those keynote thoughts that seem to stick with you for more than just a while. It’s also undoubtedly important to make sure all equipment is provided. This usually means getting a computer or a laptop for the employee, those devices should be on top of the list. There might be other stuff you’d want your employee to have, but those variables are mostly changeable. You should have a list of priorities and make sure all the necessary devices and things are at the office right on time and that they’re fully functional. You can start to incorporate a new colleague to the team by emailing them – they will appreciate it. You can provide them with some additional information and let them know you’re at their disposal. The email should be genuine and substantial and the HR writing it should be using the language that reflects the company’s culture. This opening email represents a virtual tour of the office. The virtual tour isn’t enough, and this is why it should be followed by an actual tour. Show them around, introduce them to colleagues face to face. Some anecdotes won’t do any harm either, let them see the fun and friendly side of the office (even if you’re corporate to the core). You should notify them about their rights and obligations at the very beginning. This is why you should have an employee handbook prepared in advance. Make sure it’s updated. If there are some forms to fill in (and they don’t necessarily need to wait for the starting day), you could send those over to them too. It will save them some time and the energy (yes, we can admit here and now – no one is particularly crazy about bureaucracy, especially on their first day). New employee should get to know a little bit about everyone and everything during the first week. Memorising colleagues names and nicknames might be the toughest job for some. Don’t forget to add them to mailing lists, Skype groups end other. Keeping them posted when it comes to daily tasks is easier if you include them in these discussions and threads. You should make sure they fully understood their duties and that they’re familiar with stacks you’re all using. First month should be the period of familiarizing. It’s all about getting used to a new working environment and you should pay some extra attention to helping a new employee obtain a certain level of knowledge and understanding of his new position. Provide them with information, let them know if you have any suggestions and ask them about their opinion. Being supportive is a teamwork. Not only a new team member can pick up on what matters when it comes to a project itself, but they’ll get the impression they can rely on their colleagues. This Free Template Onboarding Example was made with love for small tech teams setting up an office in Serbia. Within this Trello board, you can find template B2B contracts, Sexual harassment template and much more documentation you might need when hiring. Trello is a task management app that helps you know Who is working on What based on a Kanban system developed to keep production level high. It's free and there are endless ways to use it. Join the board here.